The Waiheke Olive Oil Company was founded in 1997. Since then it has consistently produced superb quality, award-winning extra virgin olive oil. The company is owned by John and Margaret Edwards. With its state of the art Pieralisi olive oil mill, high quality standards and attention to detail, the company has established itself as a premier olive oil producer both on Waiheke Island and in New Zealand. Matiatia Grove is one of the oldest commercial groves on Waiheke Island, 35 minutes by ferry from Auckland city. Waiheke Island produces some of the best olive oil and wine in New Zealand. The grove is planted mainly with classic Italian and Greek olive varieties including Frantoio, Pendolino, Moraiolo and Nocellara del Belice from Italy and Koroneiki from Greece. Some 'local' varieties such as J5 have also been planted bringing the total number of trees to around 2000. Wherever possible, organic practices and principles are followed and we monitor tree nutrition and soil health closely to ensure the olive crop will be in perfect condition. Margaret is a well-recognised authority in the world of New Zealand olive oil. As well as growing olives and producing award winning olive oil on Waiheke Island, she is New Zealand's only international olive oil judge. 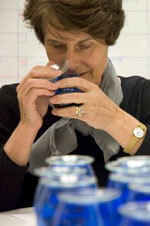 Following training in Italy, in 2003, in conjunction with staff at The New Zealand Institute for Plant and Food Research Consumer and Sensory Science Facility, Margaret set up, trained and led the New Zealand Sensory Panel for Extra Virgin Olive Oil. In 2005 the panel obtained International Olive Council recognition and retained this until the panel was disbanded in 2012. Margaret is a consultant to the olive industry, runs olive oil workshops and lectures nationally and internationally about New Zealand extra virgin olive oil. Toss with cooked vegetables before serving. Drizzle over salads, or use in dressings with lemon juice or vinegar.